We buy second hand telescopes, mounts and accessories all at competitive prices! If you have some used equipment for sale, simply email us at sales@rothervalleyoptics.co.uk with what you have for sale. Try and include some pictures if you can as this will help us value your equipment. Please also include details such as age, condition, any marks, electronics condition, any included accessories and extras. Once we have this, we can give you a value of your goods. Please see below our current range of second hand telescopes. Click here to see our second hand accessories. Please keep checking back as more and more items are added weekly! A Celestron Nexstar 130 SLT telescope in used but good condition. The mirrors are clean and have been colimated. The electrics, goto system and motors have been tested and are in full working order. This is great GOTO telescope with a large 130mm aperture. 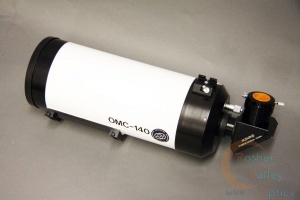 Here we have the Orion Optics UK OMC140 Mak OTA that has just been serviced by Orion Optics. The primary mirror has been resilvered and the coatings have been re applied. 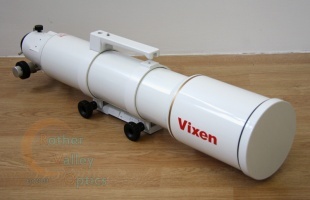 This is a superb scope that is ideally used on the moon, planets and bright deep sky objects. A second hand Celestron CPC 8" SCT Telescope. The tube has been cleaned and collimated by us, and the mirror has been checked. The optics are in fantastic condition. The handset and electronics have been tested and it's in full working order. There are some marks and scratches to the legs and base of the mount, however these are only cosmetic. Comes supplied with all standard accessories including 40mm eyepiece, 50mm finderscope and diagonal. Second hand Vixen AX103S ED Triplet OTA. Optics have been checked in regards to collimation and have had a thorough clean. A superb telescope with superb colour correction. Very sharp and ideal for imaging. Comes as an OTA only.